IRC Chess is a graphical interface which allows you to connect to your opponent using his IP address. Chess players meet on the IRC chat channels, such as Undernet #chess or DALnet #chessmasters, and play games using this interface. To connect to IRC you must have an IRC client such as mIRC or XiRCON. Both clients work in a similar fashion but I will describe how to connect to Undernet #chess using mIRC. Chess Corner has an Opponents Wanted Forum where people can meet and play chess using IRC Chess and/or games via e-mail. Add these players to your ICQ buddies list so that you can see when they are online. 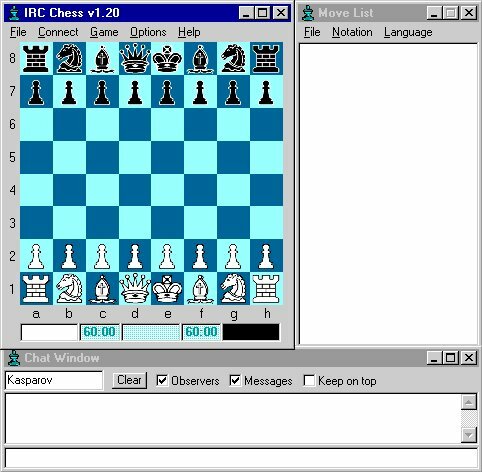 Copyright � 1998, 1999 by Chess Corner. All rights reserved.